Employing a cytochemical bioassay, we compared parathyroid function in normal and X-linked hypophosphatemic (Hyp) mice. Under basal conditionsHyp mice manifested hypocalcemia and, in accord, had a plasma bioactive parathyroid hormone concentration (3.04±0.14 pg/ml) significantly greater than that of normals (2.16±0.14 pg/ml). We confirmed the validity of the bioassay by demonstrating that the plasma collected from both mouse models diluted parallel to the assay standard curve. Moreover, after parathyroidectomy, normal andHyp mice had plasma bioactive parathyroid hormone levels approximately 90% less than those obtained under basal conditions and indistinguishable from one another. 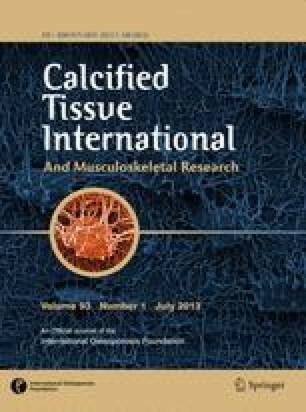 In further studies we observed that dietary calcium and/or vitamin D deprivation in both animal models resulted in a comparable decline of the plasma calcium concentration. However, the concordant increase of the circulating bioactive parathyroid hormone level was greater in the normal mice. thus, the bioactive parathyroid hormone concentration obtained in response to a low calcium challenge in normals was significantly greater than that inHyp mice In contrast, in response to dietary calcium loading, the plasma bioactive parathyroid hormone levels did not decrease significantly from basal values in either animal model. These data illustrate that the bioactive parathyroid hormone concentration in both normal andHyp mice is inversely correlated with the plasma calcium. However, while theHyp mice maintain an elevated plasma parathyroid hormone concentration under basal conditions (in response to a decreased plasma calcium), the parathyroid activity of the mutants after a more severe hypocalcemic challenge is attenuated, resulting in a significantly different model of linear correlation. Thus, these data indicate thatHyp mice manifest abnormal regulation of parathyroid function.